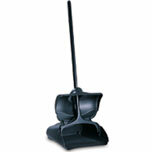 UPRIGHT DUST PAN, VINYL COATED, METAL HANDLE. BUILT IN RECESS ON THE BACK OF THE PAN ALLOWS EMPTYING WITHOUT TOUCHING THE PAN BOTTOM. LIGHTWEIGHT PLASTIC CONSTRUCTION REDUCES THE RISK OF BACK STRAIN. BLACK, 12 1/2" WIDE DUST BIN OVERALL HEIGHT 37"